Pick radius which is the numeric value expressed by the units field. The available units are: feet, meters, km, miles, and nautical miles. Entering 1000 meters is same as entering 1 km. Enabling auto-refresh option maintains a circle in the center of the view to give a sense of scale as you navigate the world in Google Earth. If auto refresh is checked then the circle is redrawn whenever you stop moving otherwise circle is drawn when Network Link is initially loaded and when it is manually refreshed. Auto-refresh mode is enabled when no coordinates are entered and the auto-refresh option is checked. However, if explicit latitude and longitude coordinates are entered then auto-refresh option will be ignored. If the center latitude and longitude are entered (in decimal degrees) then the circle will be drawn at those fixed coordinates. If you have coordinates in degrees-minutes-seconds (DMS) then you must first convert them and enter the value in decimal degrees. Try this DMS converter. If you want to navigate to place on the map and dynamically generate a circle then omit the lat/lon coordinates and check the checkbox in places panel in Google Earth left of the circle feature to activate it. At that point the networklink is activated and KML generated using the center point of the current view. Also, if you want to auto-generate the circle whenever you move in Google Earth then check the auto-refresh option and leave the lat/lon fields blank. You can select the color of the circle to be RED, GREEN, BLUE, YELOW or WHITE. If you want to customize the color with either setting transparency and/or picking a different color not in the list then you can edit the URL of the networklink and edit the color value with KML color style. If want circle drawn with an orange color then add/edit color=ff00aaff parameter on the Network Link url value. 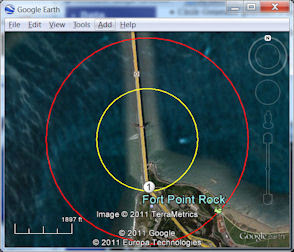 In Google Earth, right-mouse click on the Network Link of the circle feature to edit its properties. Color and opacity (alpha) values are expressed in hexadecimal notation of the form aabbggrr. The range of values for any one color is 0 to 255 (00 to ff). The order of expression is aabbggrr, where aa=alpha (00 to ff); bb=blue (00 to ff); gg=green (00 to ff); rr=red (00 to ff). For alpha, 00 is fully transparent and ff is fully opaque. For example, if you want to apply a blue color with 50 percent opacity, you would specify the following: color=7fff0000, where alpha=7f, blue=ff, green=00, and red=00. Specify the line width of the circle with a width from 1 to 5 pixels and a default value of 2. 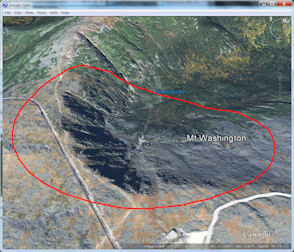 Note the circle geometry is clamped to ground and will follow the terrain so for example a hilly or mountainous region will show distortions of the lines as it clamps to the ground as shown in above screenshots.